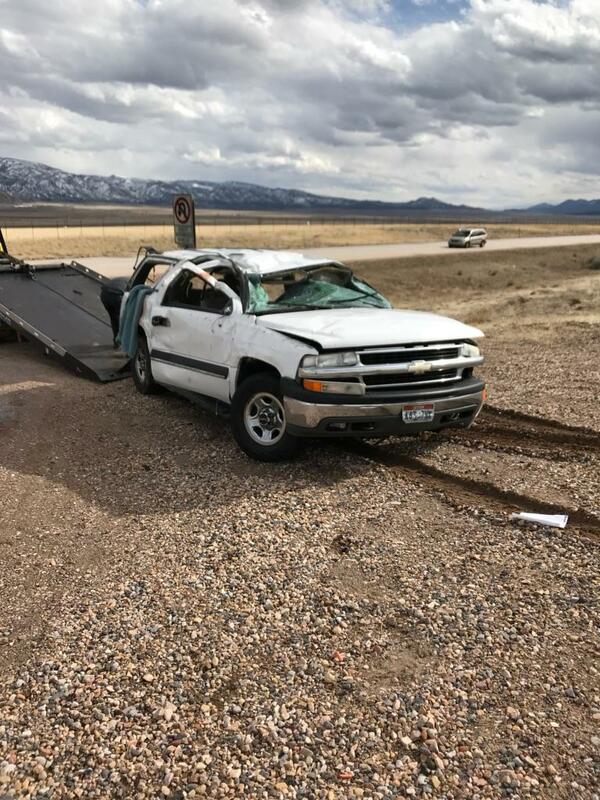 JUAB COUNTY — A road-rage incident on Interstate 15 south of Nephi Friday resulted in a rollover that injured six people. Police are looking for the driver of another vehicle believed to be involved in the incident. Utah Highway Patrol responded to the incident involving a white Chevrolet Suburban and an unknown vehicle near mile marker 213 on southbound I-15 at 3:15 p.m.
“The driver of the Suburban was engaged in a road-rage incident with another driver,” UHP said in a statement. At some point during the incident, the driver in the unknown vehicle “brake checked” the Suburban while the vehicles were in the outside lane, UHP said, causing the driver of the Suburban to swerve to the right to avoid rear-ending the other vehicle. The driver of the Suburban lost control, swerved back to the left into the median then overcorrected, causing the vehicle to roll four times before coming to rest upright. All six people in the Suburban were injured. Two occupants were critically injured, one of whom was flown to the hospital and the other transported by ground ambulance. The other occupants suffered minor injuries. All but one of the occupants was wearing seat belts, according to UHP. The driver of the other vehicle stopped initially but then left the scene, UHP said. As of Saturday afternoon, the driver and vehicle have not been found, Utah Department of Public Safety authorities told St. George News. The vehicle is described as a black Suburban or truck with partial Utah plate 7X0. It was driven by a bearded white male adult. Anyone with information that could help police identify the driver or vehicle is asked to call UHP’s Richfield dispatch center at 435-896-6471. I live in Utah, but have to say that I have never seen such bad driving as Utah drivers! I have witnessed so many people following way too close, using cell phones and just plain not paying attention. I’ve also have been a victim of road rage when my husband and I were driving in St George and someone honked at us, gunned their engine, and then sped around us clipping the mirror on the passenger’s side. What has happened to common courtesy? I hope the driver who left the scene of the accident is found an arrested. These are FRIENDS of mine, and their child. The driver in the black vehicle was riding THEM because he was not happy they were doing the speed limit. He sped up and pulled IN FRONT OF THEM, then slammed on his brakes. He stopped, got out, and YELLED AT THEM (as they lay there almost dying) then got in his vehicle and drove away. I hope they find him and sue him for everything he owns. The woman in the passenger seat is still in the hospital. She is my youngest daughter’s age (25) and broke pretty much every bone in her body. She is a sweet and caring, beautiful girl, with a small child. Her husband was driving. This is such a ridiculous tragedy.